Item # NKL, Circulation Pumps series NKLs, design N10q On Dickow Pump Co. The DICKOW-Standard pumps, series NKLs according to EN 733, are designed as centrifugal pumps of light duty for handling heat transfer media. The NKLs pumps will be applied as circulating pumps in industrial heating plants. The performance range covers capacities up to 400 nf/h and differential heads up to 90 mLC in 50 cycles service. The maximum allowable operating temperature PT is 340°C without additional cooling. The NKLs-pumps with the single acting N10q- seals can be applied when handling HTM with boiling pressure at operating temperature below the atmospheric pressure (<1 bar abs). The "N10q" seal with metallic bellows and auxiliary gland packing according to DIN 4754 is available as standard in the NKLs-HTM pumps. The design with rotating double walled bellows and proper designed wear resistant mating faces of SiC ensures a long service life, also for pumping hot oils containing some solids like coke particles and pipe scale. The rotation of the bellows and the conical shape of the seal chamber avoids clogging and seizing of the bellows. When designing mechanical seals with SiC faces, the special attributes of the ceramic material must be considered. The different thermal expansion of SiC and metallic parts cause problems in shrink-fitted connections at temperatures above 150°C. At higher temperature, the different expansion generates stress and deformations in the seal faces and the seal starts leaking. The N10 seal solved this problem by bearing the seal faces with elastic elements. 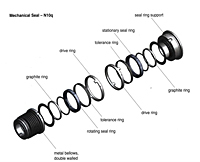 At inner diameter, the SiC-rings are located on graphite rings, at the outer diameter the SiC-rings are held in the shells by elastic, metallic tolerance rings to avoid any slipping. The NKLs-HTM pumps are single stage, single flow volute casing pumps of horizontal back-pull- out design with end suction and top discharge flanges. The back-pull-out design allows disassembly of the bearing bracket unit, complete with impeller, intermediate casing and mechanical seal without removing the volute casing from the piping system. The one-piece radial split volute casing is provided with rigid integrally cast feet for mounting on the base plate. Standard suction and discharge flanges have raised face. Flat face or groove are available as option. The volute casings of the NKLs-standard pumps have no wear rings provided. However, the design of the casings allows remachining and a subsequent installation of wear rings in case of worn out mating surfaces. NKLs-pumps have closed impellers, cast-en-bloc, hydraulically balanced by throttle gap and relief bores to minimize axial loads. All impellers are dynamically balanced acc. to DIN ISO 1940 part 1, at a balance grade of G 6.3, that grants a smooth and vibration free operation of the pump. The impellers are arranged on the pump shaft in overhung position and are fixed by keys and shaft nuts with Heli-Coil inserts. The pump shafts are capable for receiving the driving power transmission. Minor deflections ensure a high reliability of operation. The pump shafts are manufactured of corrosion resistant material. The pump shaft is carried in generously dimensioned antifriction bearings. Two bearings are positioned at pump- and coupling side outside the pumped liquid. There is no additional sleeve bearing unit available in the fluid. Oil lubrication is standard. The oil level in the bearing bracket is controlled by constant level oiler. Service life of the bearings reaches 20,000 operating hours.